In Houston, more than 26,000 pounds of nonperishable items were collected from more than 500 team members and homeowners during the two-week drive, which ran from November 1 to 15. This donation helped to provide more than 79,000 meals to those in need. Locally, the Thanksgiving Drive benefitted Houston Food Bank, which is America’s largest food bank, distributing to 600 hunger relief charities in 18 southeast Texas Counties. David Weekley team members delivered the collected items to Houston Food Bank to distribute to families in time for the holiday. The Houston Food Bank provides 83 million nutritious meals to food pantries, soup kitchens, senior centers and other agencies. The organization is America’s largest food bank, distributing to 600 hunger relief charities in 18 southeast Texas counties. Other community services include nutrition education and assistance with job training and food stamp applications. 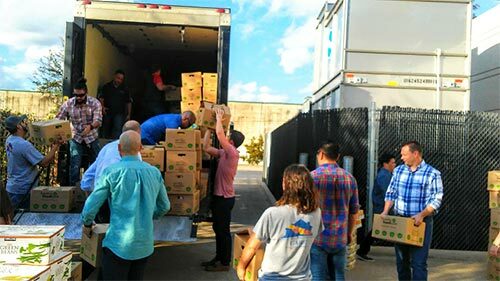 Team members from David Weekley Homes donated 26,000 pounds of nonperishables and food items to Houston Food Bank to benefit families in need.